John Steinbeck’s The Grapes of Wrath was published 75 years ago in April 1939. The bestselling book of the year, with more than 400,000 copies in print, it also won the Pulitzer Prize for Fiction. 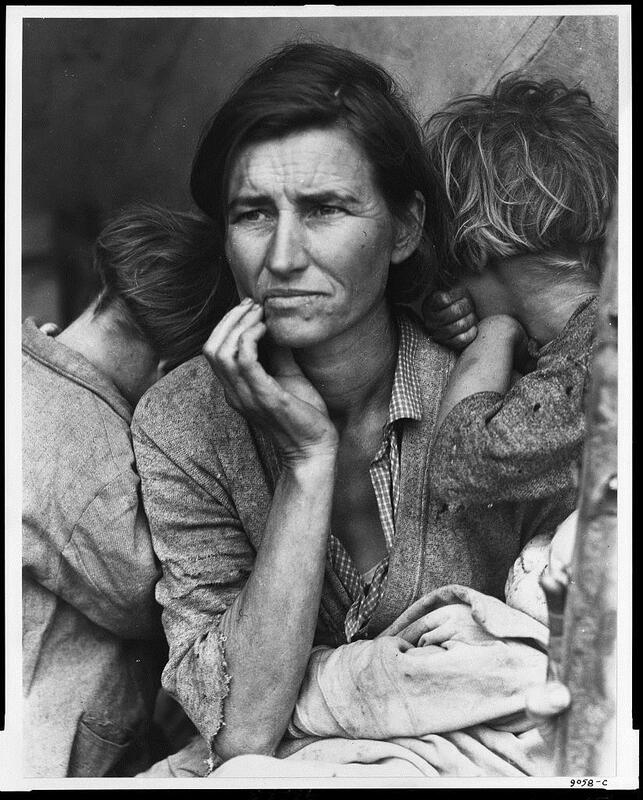 Although focused on the journey and travails of one family, the Joads, it was also the story of tens of thousands like them forced off their farms as owners or sharecroppers in Oklahoma and elsewhere in the Midwest by foreclosures and the great drought that created the Dust Bowl. 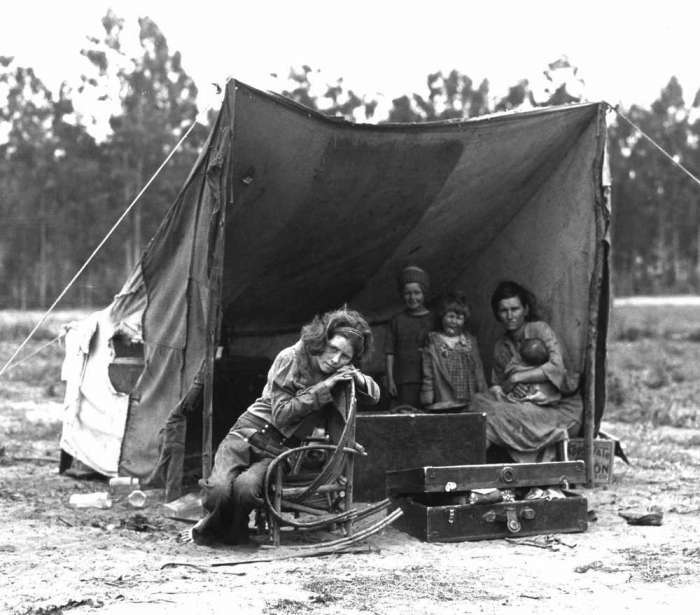 They sought a better life in California where they were all known collectively as “Okies” and treated as undesirables. Before fictionalizing their story, Steinbeck had researched and written about their plight in newspaper articles in 1936: Thousands of them are crossing the borders in ancient rattling automobiles, destitute and hungry and homeless, ready to accept any pay so they may eat and feed their children….They arrive in California usually having used up every resource to get there, even to the selling of the poor blankets and utensils and tools on the way to buy gasoline. They arrive bewildered and beaten. 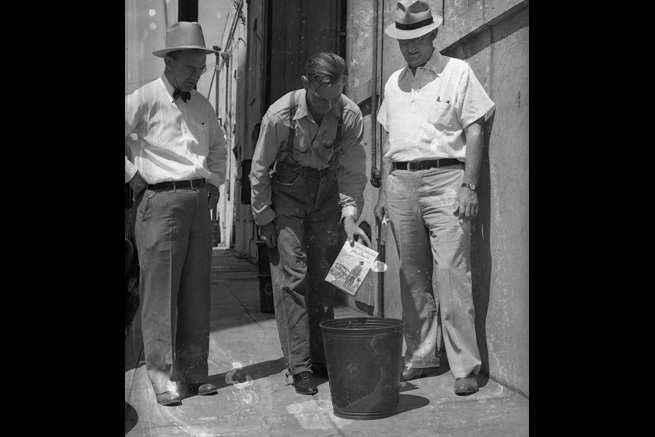 Steinbeck had traveled to the model migrant camps sponsored by the federal Farm Security Administration to assist a small portion of these needy families, providing sanitary facilities, hot water, medical care and other amenities, and could contrast them with the terrible conditions on the large, industrial scale farms where the managers for absentee owners treated the workers harshly, paid poorly, and reacted with violence to any hint of workers’ organizing for better conditions. Hence, it is not surprising that the California agricultural industry raised an angry voice against Steinbeck’s novel, even burning it as a symbol of their outrage. He was accused of being a revolutionary and having made up the details about the conditions. Now I must tell you that I have just finished a book which is an unforgettable experience in reading. “The Grapes of Wrath” by John Steinbeck, both repels and attracts you. The horrors of the picture, so well-drawn, make you dread sometimes to begin the next chapter, and yet you cannot lay the book down or even skip a page. Somewhere I saw the criticism that this book was anti-religious, but somehow I cannot imagine thinking of “Ma” without, at the same time, thinking of the love “that passeth all understanding.” The book is coarse in spots, but life is coarse in spots, and story is very beautiful in spots just as life is. We do not dwell upon man’s lower nature any more than we have to in life, but we know it exists and we pass over it charitably and are surprised how much there is of fineness that comes out of the baser clay. Even from life’s sorrows some good must come. What could be a better illustration than the closing chapter of this book? The “coarseness” that she refers to was interpreted by others as obscenity, the use of earthy words and descriptions of bodily functions that wouldn’t even attract notice in today’s world, but most particularly the very last scene where the daughter of the family (who had delivered a still-born child) offers her breast full of milk to feed a starving man. California localities banned the book, as much for its language as for its politics. At the same time, it was praised as a weapon against injustice. Malcolm Cowley wrote in The New Republic, “It belongs very high in the category of the great angry books like Uncle Tom’s Cabin that have roused a people to fight against intolerable wrongs.” The book led to Congressional hearings in 1940 where Secretary of Labor Frances Perkins advocated extending wage regulation to the “factories in the fields” where the farm laborers “should be treated as virtual industrial workers.” Wartime concerns probably slowed reforms although the low wages of agricultural workers and their destitution was recognized as a national problem, not just a California issue. 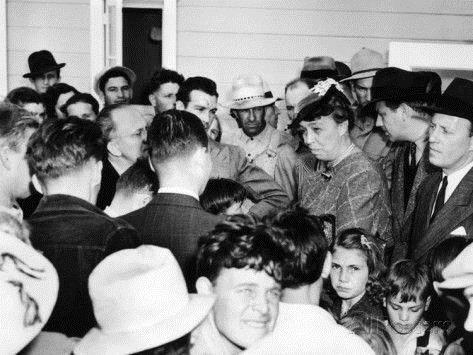 Steinbeck’s celebrity led to meetings with President Roosevelt twice in 1940. He had written to FDR concerned about the impact of the war in Mexico where he had been working and thought that a propaganda office mobilizing the talents of the American radio and movie industry could counter the influence of fascism there and in the rest of the hemisphere. He later suggested counterfeiting German Reich marks to hurt Hitler. While nothing specific came of these meetings, Steinbeck remained a supporter of the President as he had been of the New Deal from its inception. The writing and opinions expressed herein are those of the authors and do not necessarily reflect the positions of the Roosevelt House Public Policy Institute or Hunter College.